The luxurious entrance in Oei Tiong Ham Concern Headquarters. architects of this building also the year its finished, 1930. In economy, we recognized conglomerate company model. Its a combination of two or more corporations engaged in entirely different businesses that fall under one corporate group, usually involving a parent company and many subsidiaries. Conglomerates are often large and multinational. Conglomerates also often related to the tycoon, a billionaire! Here in Semarang, its widely known about the story of the first tycoon in South East Asia, a man who have a reputation as “200 million guilder man”. His name was Oei Tiong Ham, I’m not going to write down about his biography, because you can find it easily in the internet. 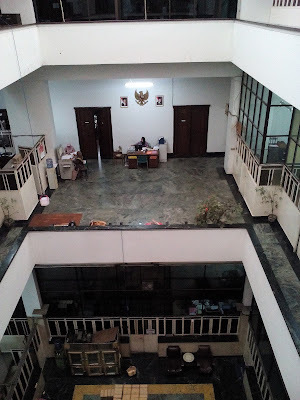 But I’m going to write down about his legacy, a luxury-three story building that used to be his company headquarters, located in Kota Lama (eng: Old Town), Semarang. It’s a bit hard to going inside, exploring the proof of Oei Tiong Ham Concern conglomeration success story. But, when there’s a will there’s a way! Last week I used to help the Dutch Experts related to the heritage preservation from Missing Link. One’s of the activity is inviting the owner of the buildings in Kota Lama area. Then I met with Mas Nur, the Marketing Manager of PT. Rajawali Nusindo, the company that used to managed the legacy of Oei Tiong Ham Concern after the whole assets is confiscated by Indonesian Government in 1961. Well, its supposed to be a great company, but, just like the others company who managed the asset from nationalization, the performance is declined, not as good as its supposed to be. Hehehe, back to the story, then together with two vrouwen from Missing Link, Pauline and Esther, we explored this building, with the permission from Mas Nur of course. Paulie, one's of the expert from Missing Link. Taken from the 3rd floor, office and warehouse as well! One things that I have to say when I entering the building is, enormous! All of the material which used here seems to be the finest material that they can get at that time. High quality and colourful marbles used as the floor tile and also wall decoration. 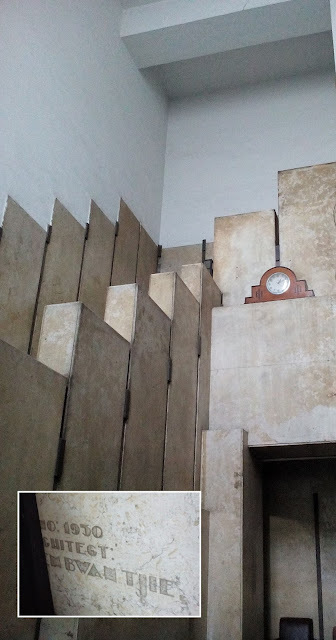 Here also in the entrance we found the inscription that the building is finished on 1930, and designed by Liem Bwan Tjie, the prominent Chinese architect, that supposed to be the first Chinese descent architect in Indonesia also. The building, in my opinion is really a models of green building. Its have a good ventilation to managed the good air circulation from the side wall and also from the roof. There’s a special form of glass ceiling to maximize the application of natural lighting. But rather than using all of these advantages of design, the people there currently made some modification that even make all of these things become useless. Like the adding of air conditioner system and the heat pump, they placed it inside the building also, then you can imagine how it’ll made the building so “warm”. Also several ventilation are closed, and so much modification in its lavatory. Even the main hall, now functioned as warehouse also. Screw it all! At least this building are still in good condition, because of still in used, not abandoned like several building in Kota Lama. We also can find the secret cabinet behind the wall decoration in the meeting room. Wow! What a functional design! Oei Tiong Ham itself never worked in this building, because its finished in 1930, he already died 6 years before, on 1924 in Singapore. At that time the Oei Tiong Ham Concern runs by his successors, Oei Tjong Hauw, the sons of Oei Tiong Ham from his 4th wife. Where is The Exact Place of De Locomotief Office?